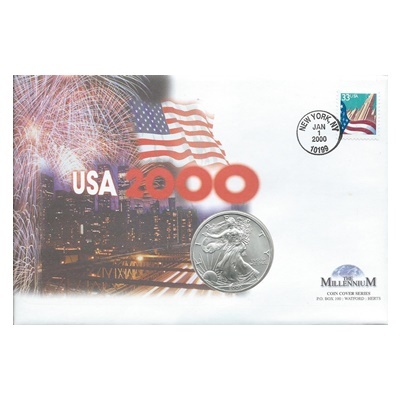 This colourful First Day coin cover issued in 2000 and named "USA 2000" celebrates the arrival of the new millennium. The USA 2000 coin cover houses an American Eagle silver 1oz coin. The coin was issued by the United States Mint. The 2000 American silver eagle bears an obverse image of Liberty walking toward the sunrise while holding an olive branch in her hands. This design actually debuted in 1916 on the half dollar and remained on that coin until 1947. The design, by Adolph A. Weinman, became so beloved by the American public that the work was revived on the American silver eagle in 1986 and has remains to this day. 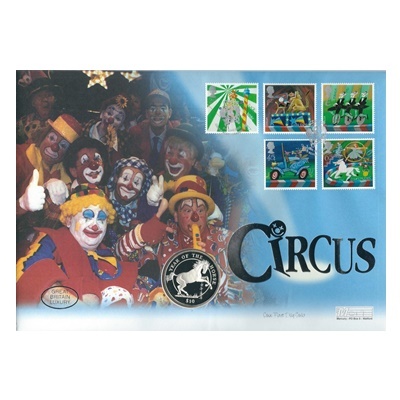 The coin cover is postmarked New York, NY 1st January 2000 with an American stamp.